The fishing license must be clearly visible on the arm. In order to fish in the river Lagan, a fishing licence is required. Fishing licences can be bought at Relax Fishing Sweden, Laholms Sportfiske and at the Tourist Information office among others. More places can be found here. Lost fishing licences will not be replaced! Children and youth under the age of 18, fish for free. October 1st to 14th: Fishing only 6 am to 7 pm. March 1st-7th and October 1st-14th: Season ticket holder only! Only one rod per person. Use unleaded baits and sinkers. a) Foul hooking is forbidden according to Swedish law. b) Intentionally or unintentionally hooked fish on anyplace other than the mouth or throat shall be unhooked with the greatest of care and immediately put back in the water. The fish must not be removed from the water when this is taking place. c) Casting upstream is not allowed. d) 1-14/10 only fishing with single-hook is allowed. Trolling permitted only between the outlet of the river Smedjeån and the island just upstream Lagaoset (the estuary). Fishing by boat not permitted in March or September 15th to October 14th. Spinning is defined as fishing with a spinning rod and a multiplier or a reel. Permitted forms of bait include spoon, spinner, wobbler, fly, jig and angling with baited hooks. All other forms of bait forbidden. Fly-fishing is defined as fishing with a flyrod, a flyline, leader, and fly. Be careful when wading. The water level can unexpectedly rise. Casting upstream is not allowed. Fishing is allowed from sign approximately 250 m downstream the power-station in Laholm to the sea, a distance of about 8 km. October 1st to 14th fishing only in the upper region, including the west point of Ösarp's island (does not include European flounder). Fly-fishing: March 1st to April 30th from Gamla åfåran (the old river furrow) to the estuary on the south side of the river Lagan. 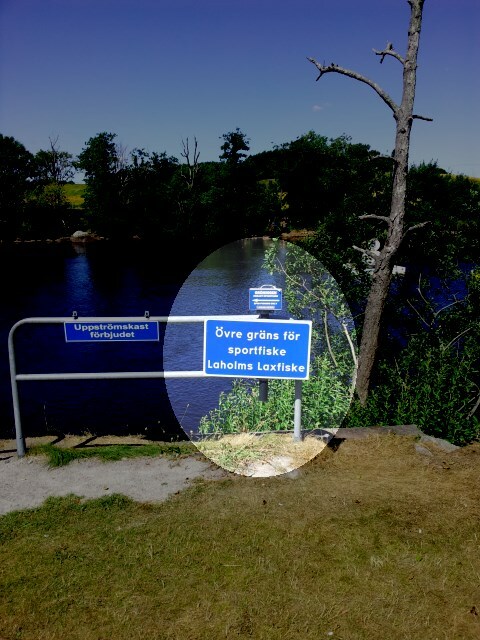 By Jise's pool, Per Karl's Hall, the bridge (purifying plant) and Svinaholmen (Ösarp) within sign-posted area. 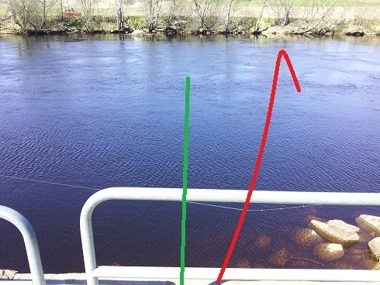 Change of angling position should be practiced when necessary. Spinning: At Gröningen, Halmstadhålan and the purifying plant (at the power line) within sign-posted area. European flounder only between Daggan-the sea, and only bottom fishing. Special licence required for Smedjeån. A maximum of three salmon-like fish per day allowed. Caught fish may be kept. Spawned salmon and see trout must be returned. 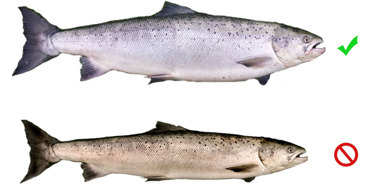 Salmon with its adipose fin intact, is recommended to release back into the wild. Catch reports: Caught salmon and sea trout must be measured, weighed and reported at the latest the day after the catch. Registering is compulsory. Register your catch at Laxahuset down at Gröningen. A season-ticket will be given through a raffle, to one person who's registered their catch. For further information, please see notices by the river Lagan. Other fish species according to current regulations. Angler must wear the fishing licence clearly visible in a plastic cover on the arm. It is absolutely necessary to follow directions given by the supervisor. Anglers who violate current regulations or who act in a disruptive manner towards anglers or others will be banned from further fishing. It is a prerequisite that you show respect toward the environment, your surroundings and the animal life therein. Discarded equipment, lines and hooks, are an unnecessary hazard. Please ensure that you throw all waste, food, paper etc. into the bins. Angler must be able to identify themselves with a valid ID, if asked to by supervisor. ”Marking” or reserving of fishing spots are not allowed. The person who catches the largest salmon during the season is crowned Laholm's King/Queen of Salmon. The catch must be verified. Prize: A seasonal fishing licence and a diploma. Changes or amendments to the rules may take place during the fishing season. These will be posted at Laxahuset and on our website. It is up to every angler to keep him/herself aware of these. Breach of the rules can result in withdrawal of the right to fish.